CCTV pictures have been released of a man who police want to speak to after a taxi driver was robbed in Edinburgh. The 55-year-old victim had a high-value Rolex watch stolen on Wardlaw Place in Gorgie on Friday, 24 February. He picked the passenger up in Clermiston and took him to an all-night bakery on Morrison Street before dropping him off outside flats. The passenger then threatened the driver with a knife. A struggle ensued and the victim's hand was cut before the suspect fled with the watch, worth £7,500, at about 05:00. 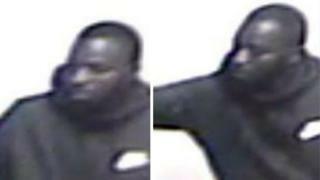 The man police want to speak to is black, in his 20s, about 5ft 4in to 5ft 6in tall, with short black shaven hair and a short shaven beard. At the time of the incident, he was wearing a black Nike hooded jacket. Det Con Joyce Gunderson, of Police Scotland, said: "The male pictured is believed to be of significance to my investigation. "Anyone who can assist in identifying him is asked to come forward. Similarly, I would ask the male himself to get in touch with police and help with our investigation."